You can click HERE to sign up for this Extravaganza. Don't miss out! 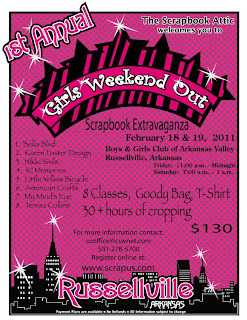 We have a great line up for classes, stuffed goodie bags, the collectible t-shirt, and a great time with the girls!! If you go the BO BUNNY WEBSITE (just click the link here) you can find freebies! They are great!! 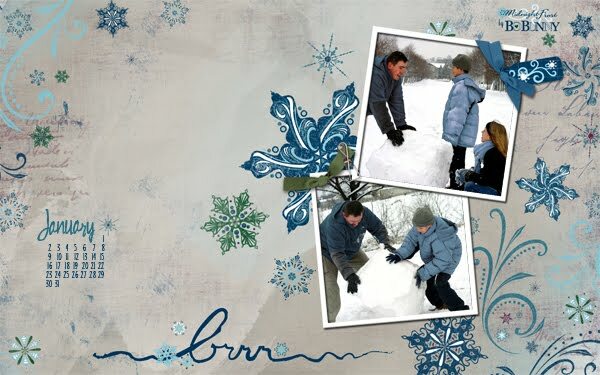 You'll find a current desktop calendar that you can add your own photos to. I love this about Bo Bunny! A new and beautiful desktop calendar each month. So what are you waiting for? Spruce up your desktop with a calendar from Bo Bunny. New Look and another Extravaganza!! Just wanted to let you know you will start to see our little blog updated more often! Our first update/news event: FIRST EVER EXTRAVAGANZA ON THE ROAD!!! Friday: Doors Open at 11:00 a.m. Registration will begin at 10 a.m. Classes will begin at 8:00 a.m. Crop Party will begin at 7:00 p.m. Doors will close at 2 a.m. 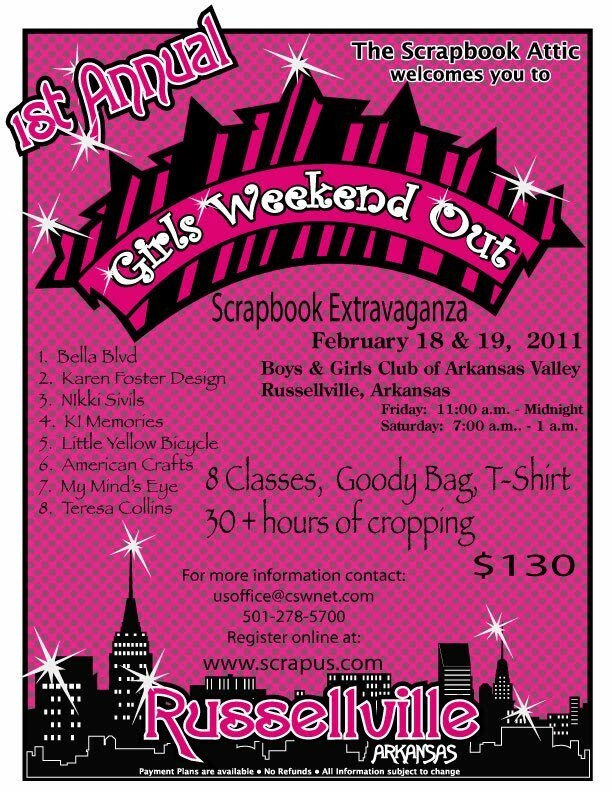 If the weather prevents us from driving to Russellville we will cancel the Extravaganza. However, we will ship to you the goody bag, t-shirt, and all 8 class kits free of charge. Instruction sheets with photos will be provided for each class kit. If the weather is bad but driveable for us we will not cancel however, if your area is to icy and you can't drive we will ship all your goodies to you free of charge. This is for bad weather only. We feel that this is the best way to make it fair to everyone. A complete list of class sponsors will be updated in a day or two but until then, I'd like to put the SPOTLIGHT on one of our sponsors for this Extravaganza: BO-BUNNY. One of their newest lines from CHA WINTER 2011 (and my personal favorite!) 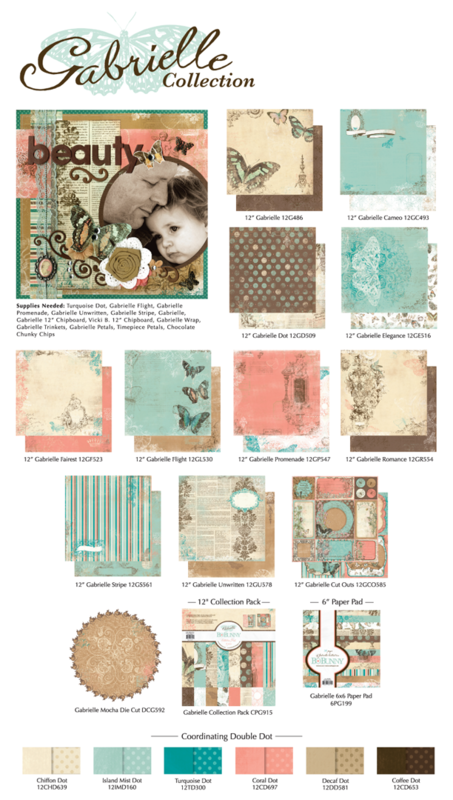 is the Gabrielle Collection. You can go to their website HERE to see in detail all that's included in this fabulous new line! Rich chocolate, sweet pinks, gorgeous blues, fluttering butterflies, and romantic prints are what this line is all about. I can't wait to get my hands on these to create with! Why don't you hop on over to Bo-Bunny and see what all they have going on. Their website is so pretty and their blog is GREAT! Don't miss a thing... click HERE to be taken to their blog. I'll be back soon with more great things from Bo-Bunny as well as our other sponsors.